Oddly, there are only two Pigeon Points in all of California. Ok, that in itself isn't odd, but they are both located in Santa Clara County and only about twelve miles apart. I had been to the southern one in Coyote Lake County Park four years earlier, today I would visit the second one located just outside Anderson Lake County Park. I got to the gated entrance about 20min before it was scheduled to open at 8a, which meant I not only had to sit around for it to open, but I got to pay $6 for the privilege of driving up to the top of the dam and parking there. In hindsight, I could have parked for free lower down at the picnic sites and simply hiked up one of the trails leading to the dam. Live and learn. As I started out shortly after 8a, the weather was unusually unsettled for mid-May with partly overcast skies though no real threat of rain. Cooler temps and a strong breeze kept things nice for hiking today. At the north end of the dam I followed a trail down and across the overflow channel, then contouring around the lake as the trail diminished to a use trail and then weakening threads as they passed across a cliff face. Rock had been quarried here in order to build the dam back in the day. It was darn close to class 3 as I had to be careful not to slip on the steep slope. I was impressed that there were no Danger! or other warning signs to discourage folks to continue around the lake in this direction. I suspect few folks actually go around this way on foot - most probably use a boat to access the western shoreline north of the dam. Once around the quarry area things got easier. I picked up an old ranch road shown on the topo map but disused for decades. Grass, brush and trees all encroached on the roadbed, but it was still useable and I followed it as best I could, diverting in a few places where it was completely blocked. After the first mile, I reached a junction and turned left, following another old road, also long disused. This traveled up more open grass slopes, making it easier to follow. Where the road made a large bend to the left I cut a more direct line up the slope, all but abandoning the road. It was a nice gradient and a fine route to use to reach the ridgeline above which I managed after about 45min. Views open up not only overlooking the lake, but west across Morgan Hill lying below in Coyote Valley. I found a very decent dirt road running along the ridge, not unexpected from my study of the satellite views earlier in the morning. As I was walking along I came across an 18" gopher snake lying in the road, having little luck in warming itself this morning with the sun mostly hidden behind clouds. The road runs right up to the top of Pigeon Point in about a mile, making for an easy summit barely an hour after starting out. I noted a gravel road continuing north from Pigeon Point and I wondered from where it originated - the satellite view showed this continuing road as dirt, so it must be a fairly new development, but for what purpose I couldn't really guess at. 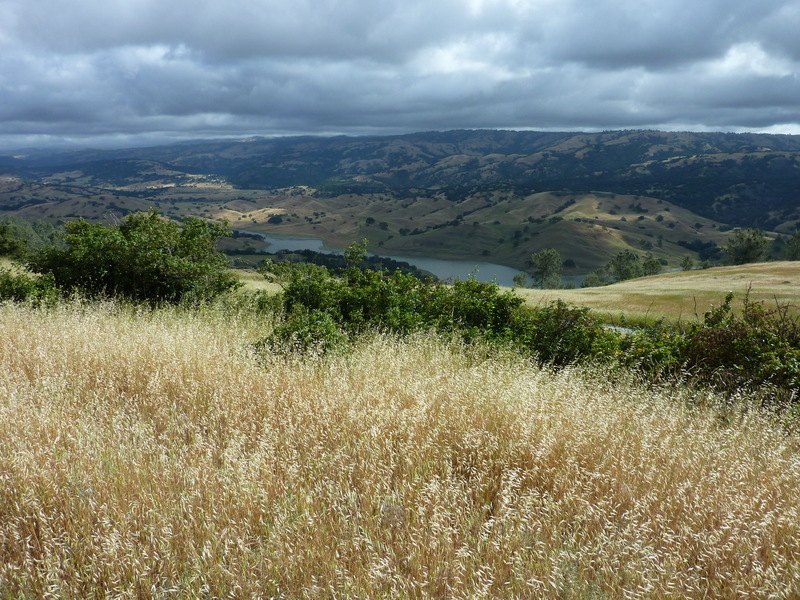 With no trees to block the views, they are open in all directions, with Anderson Reservoir visible to the north and southeast, Gilroy and Morgan Hill to the south and west, respectively. Things really got interesting on the way back. On a whim, I decided to follow the nice road running along the crest to see if there wasn't an easier route from the west or southwest. The road does not continue all the way down that side as I had surmised, but stops about halfway down. Some errosion mitigation work continues on what used to be the old roadbed, now being converted back to a more natural state. I saw some buildings below but had no idea what they were. I could see a parking lot full of cars and guessed it was some sort of school. School, yes, but not your normal variety. As I continued down the slopes on a steep, cross-country descent, I was about 50ft above the buildings at their south end when I heard some shouting, "Hands up!" and "On the ground!" I was now guessing this was some sort of correctional facility, but there seemed to be no fencing to keep me out, or for that matter, any inmates in. As I dropped into what looked like a neglected back yard of the school, I tried to move left towards the creek and away from the building to avoid detection. I was stopped by a tall fence, behind which was a jungle of overgrowth including a generous helping of poison oak. Barbed-wire rarely stops me, but this stuff sure does. Looking back towards the school I saw men walking around with reflective vests, others in law enforcement wear. I could see a number of sheriffs' vehicles parked in the center of a courtyard area. It seemed that I hadn't yet been spotted since no one came to see what I was up to. Still, I didn't see a way out of this predicament given all the poison oak I had no intention of fighting through. What to do? I decided to give up. Or rather, to turn myself in and simply say I was lost. I wasn't exactly lost since I knew where I was with respect to the creek, the park and my car, but it would help sell my story and collect sympathy. I passed along a walkway between two building and then up to two gentleman I found there, one wearing the reflective vest and sitting down, the other wearing a sheriff's uniform and standing by a doorway. I got within about 15ft before either noticed me. Not knowing who to choose, I picked the uniformed guy standing there and said, "Hi, I'm lost. Can you help me." The guy looked at me for a split second before shouting, "Freeze! Don't move!" Ok, this was weird. At the same time, I suddenly realized what I had stumbled upon, thanks in large part to a sign in the courtyard that said, Training in progress. I had wandered into the County Sheriff's training facility in the middle of a training session. The guys with day-glo vests were the observers/trainers, those in uniform were cadets in training. The poor guy I spoke to found me odd, but guessed I was another scenario that he needed to deal with. I turned to the guy sitting down with the vest as he asked, "Did you just come down from the park?" I smiled somewhat sheepishly, "Yeah..."